Get Cadel Evans' insight on why every kid should learn to ride a bike. 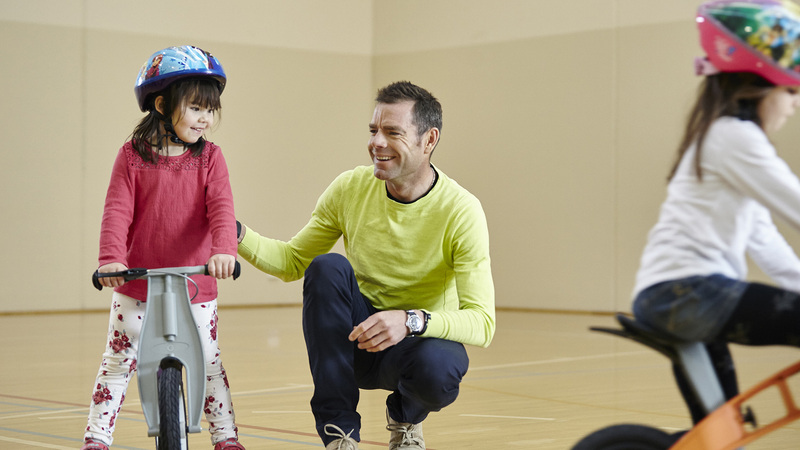 Learning to ride a bike is an important skill that every child should learn, Cadel Evans says. “Sure, there may be a few wobbles and scraped knees in the beginning but once they’ve mastered it, riding a bike is a skill that will stay with your child for life,” he says. Bike riding is a skill that comes with a whole range of benefits. While most of us know that regular cycling contributes to better physical health, there are plenty of other reasons why learning to ride a bike is more important than ever. Here are just a handful of them. The Australian Guidelines for Health recommend that children should engage in at least one hour of vigorous physical activity every day to stay healthy. However, according to The Heart Foundation, as many as 80% of Australian children aren’t meeting these guidelines. Encouraging your child to ride a bike while they're young helps to establish healthy exercise habits that are likely to stay with them for life. Riding a bike not only improves physical fitness, it also benefits your child’s learning development and mental health. Research shows that students who ride a bike to school are more focused and ready to learn, compared with those who are driven. Taking part in regular physical activity also has links to increase happiness, as well as giving kids more opportunities to make social connections. "Riding a bike not only improves physical fitness, it also benefits your child’s learning development and mental health." Cycling is an activity that all ages can enjoy. Mums, dads, kids, and even grandparents can take part in a family bike ride. It’s a great way to share some quality time, and it’s good for you too. Remember, the key to family bike rides is to have fun. So start slowly and take plenty of breaks to give little riders time to rest. Teaching your child to ride a bike has long-term benefits for the environment. Using active transport like cycling instead of driving reduces carbon emissions, eases traffic congestion and eliminates parking problems. Less pollution and traffic mean our communities will become greener, healthier and less stressful places to live. Cadel describes bikes as “the perfect vehicle for transport.” And he’s right. Once your child gets older, riding a bike becomes a quick and healthy way for them to get to and from school, sporting and play activities. Even better, it saves you time because your child won’t have to rely on you for lifts. Now that’s a benefit every parent can relate to!